A strong message to the SYRIZA-ANEL coalition government was sent by trade unionists and workers who broke into the Ministry of Labour, after a request to meet with officials was turned down. The mobilization of numerous labour and workers' unions and associations began at Omonoia square in downtown Athens on Tuesday morning and ended at the Ministry of Labour where members of PAME unfolded a huge banner with the slogan "Government-big capital-EU, pay attention: Get your dirty hands off the strike. It is a workers' right". When the demonstration arrived at the Labour Ministry, the representatives of the workers asked for a meeting with the Minister Effie Achtsioglou. The Ministry declined to answer and the workers opened the metal shutters of the building in, racing up to the eighth floor of the building. argues with trade unionists and workers in her office. 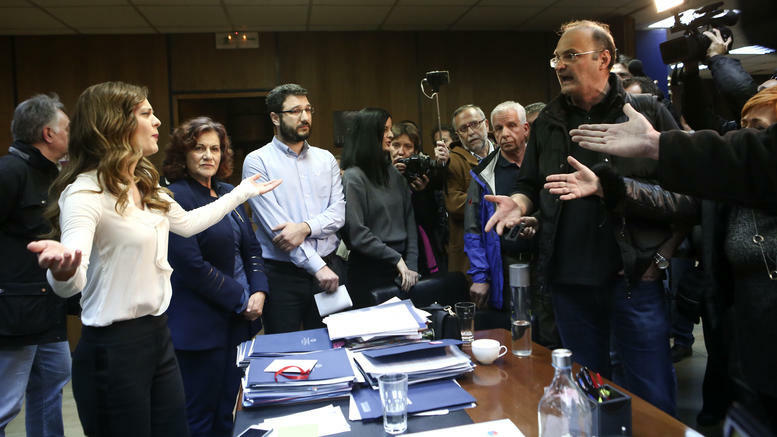 Representatives of PAME and other trade unions confronted Minister Achtsioglou and other officials, demanding the immediate withdrawal of the new ombibus bill which includes amendment that restricts significantly the right of strike. The workers said that the right of strike has been a very important conquest of the working class which was achieved through difficult and continuous struggles. Minister Achtsioglou kept an unacceptably defiant stance responding with a plain "no" to the demands of the trade unionists and denied to respond to a series of issues set by PAME members. "We will not let them to do it" said the President of the Pensioner's Federation Dimos Koumpouris and added: "We will continue our struggle in every way". The All-Workers Militant Front (PAME) have called workers, youth, pensioners, the unemployed, farmers, the self-employed, all the people to massive, militant action in response to the new antipeople-antiworkers measures of the government. A strike has been scheduled for Friday 12 January.